When you are buying a toilet seat, the last thing you want to deal with is a difficult fitting procedure. 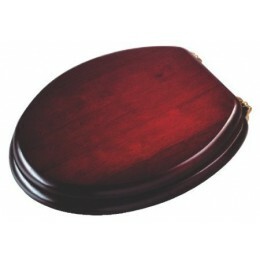 This toilet seat was made with adjustable brass brackets to allow you to fit it onto just about any different toilet pan. Coming with a detailed series of instructions and all the fixings and fittings that you are going to need, this makes the perfect choice for any bathroom that needs a solid yet glamorous finish. The dark mahogany look instantly provides a great contrast to the usually light bathroom, and the quality of the finish is almost unparalleled. If you are looking for a quality option for your future toilet seat, then this is the ideal solution – comfort, class and cost-effectiveness, all in the one location! Adjustable fixing hinges between: 110-200mm.